Why Is Health Care So Stressful? 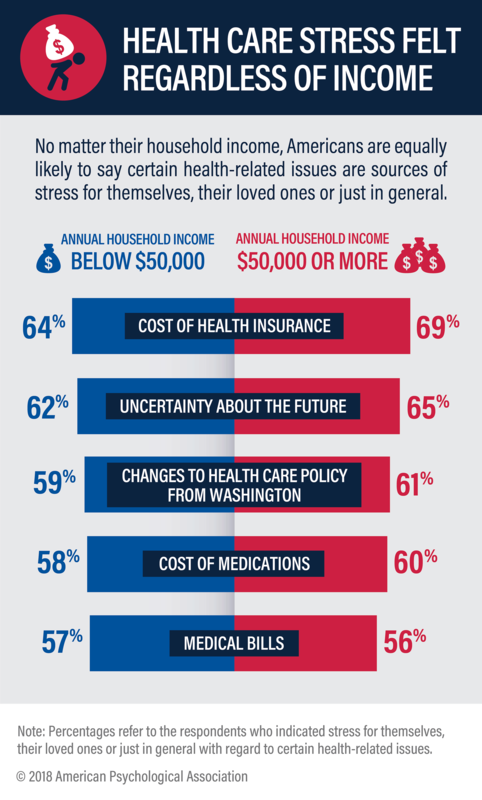 No matter who they are or where they live, Americans are stressed. A lot of things feed into that stress — work and money, for example — but there’s one stressor that affects us all pretty much unilaterally: health care. That’s according to a 2018 report from the American Psychological Association (APA), which found that 60 percent of Americans have stress brought on by some health problem, either their own or a loved one’s. But they’re not just stressed about health problems themselves, or even about making health care decisions overall. Costs and uncertainty about health care’s future also keep Americans up at night, thanks to medical bills that keep rising and a backdrop of unpredictable health legislation. Age. Health costs trigger stress for all ages — even though that stress does go down slightly as age goes up. For example, 72 percent of millennials consider health care costs a stressor, followed by Gen Xers (71 percent) and baby boomers (61 percent). Location. Health-related stress also strikes urban dwellers, suburbanites and small-town residents in similar numbers, although those in bigger cities tend to feel it at higher levels. On a scale of 1 to 10, Americans in urban areas scored their health-related stress at a 5.2, followed by rural areas (4.7) and the suburbs (4.5). Income level. Even higher-income earners aren’t immune to health care stress, and may even face a slightly higher risk. Among those who make less than $50,000 annually, stress about insurance costs comes in at 64 percent, compared to 69 percent of those who make more than $50,000. Stress isn’t just something that affects you when the going gets tough: It can take a real toll on long-term health. According to the APA, chronic stress can wreak all kinds of havoc on the body, from muscle tension to problems with the lungs, heart, liver, stomach and reproductive system. But don’t just assume that health-related stress is inevitable. It’s not. By prudently planning for health care costs, anyone can help manage their stress for a better quality of life overall. Here are a few tips to get you going. Get a health savings account. The pretax savings you get from having a health savings account (HSA) can make a huge difference in keeping the costs (and stress) of care more manageable. Read up as much as you can. Poor health literacy — or a lack of knowledge about health information — adds to the stress linked with health care. But by taking an active part in your health care, from educating yourself about your medical concerns and insurance coverage to asking questions at every doctor’s visit, you can help protect yourself against unnecessary or unexpected medical costs. Consider supplemental insurance. Having health insurance can reduce stress, but it doesn’t get rid of it: According to the APA’s report, uninsured Americans rated their stress as a 5.6 out of 10. For the insured, that number only dropped to 4.7. That’s because even with conventional insurance, unexpected costs and deductibles can add up. But a supplemental policy that pays out fixed cash amounts for unexpected events like critical illnesses, accidents or hospitalizations can help bridge the cost gaps that regular insurance leaves. There’s never a surefire way to cut out health-related stress entirely. Stress is just a part of life. But by making health care decisions to protect yourself from costs in advance, you can do a lot for your mental well-being — and your wallet, too. What Is a Pre-Existing Condition and Why Does It Matter?